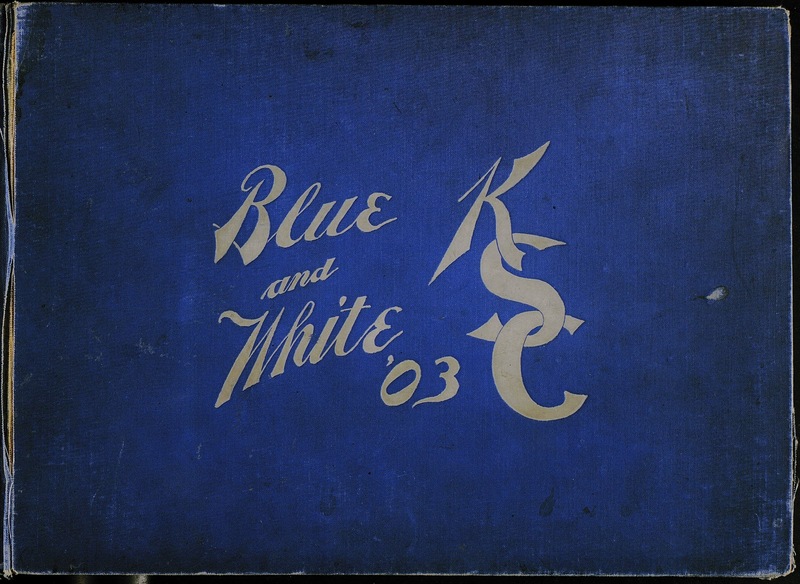 For the University of Kentucky, Centennial meant more than a nostalgic look at its past. 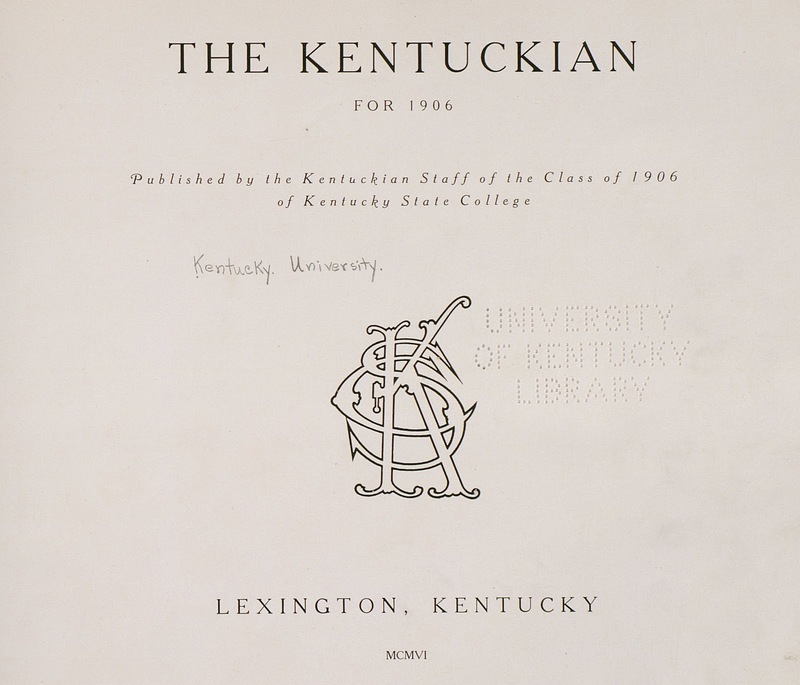 Of course, Kentucky looked back with pride at the energy and endurance which had carried the university from its unprepossessing origins through its early rough-and-tumble struggle for existence, in a state that was never rich, among people who were never devoted to learning. Kentuckians had the right to be proud of a university that had overcome obstacles which might have caused a less stubborn people to settle for much less. The real focus of Centennial was on the future. It was a time for a realistic look at the University, its weaknesses and limitations as well as its new strengths and rapid growth. It was a time for appraisal as well as for celebration. Both purposes were served. Years of planning brought leading figures from the worlds of intellect, of politics, and of the arts to exchange ideas with Kentucky students and faculty. Graduates who had achieved distinction were honored. 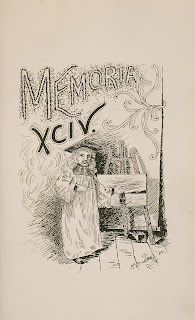 Books, music, art, drama, scholarly accomplishments were produced. And for students, alumni, and citizens of the state, there were times for pure entertainment. Centennial plans, years in the making, were announced formally February 5, 1965, at a Centennial Preview Press Dinner. William B. Arthur, managing editor of Look magazine and a U.K. alumnus, was a principal speaker. At this dinner, President Oswald revealed that President Lyndon B. Johnson would address the Founders Day convocation. Dr. and Mrs. Thomas D. Clark who headed the Centennial Committee were also present at the Centennial Preview Press Dinner. Governor Edward T. Breathitt, John W. Oswald, and President Lyndon B. Johnson welcomed in the Day of Centennial. It was a big moment for the Oswald children, to have the opportunity to meet the President of the United States. National Media were in force to cover President Johnson’s speech. To stimulate the intellectual life of students, faculty, and the public, the University brought to its campus distinguished persons from the worlds of politics, religion, the humanities and sciences. Some taught for a semester and some took part in the shorter conferences. Some lectured at the University’s community as well. Winner of the Nobel Prize for Medicine in 1955, Dr. Hugo Thorell, the director of the biochemistry department of the Nobel Medical Institute in Stockholm. He held a one semester professorship during the Centennial. The fine arts at the University produced a number of special events. 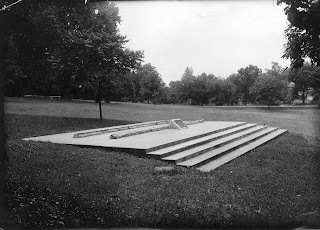 In most of these, students took part, starting with pre-centennial Shakespeare productions, and the Centennial Theater produced plays during the summer. The Art Department had special exhibits in addition to student shows. A contest was held for original music written by students. Verdi’s Manzoni Requiem was performed by the U.K. Choristers, the Lexington Singers, and the Cincinnati Symphony, and the performance was to be repeated in Carnegie Hall. Norman Thomas attracted an enthusiastic crowd for his lectures and discussions. His visit was sponsored by the Student Centennial Committee. Sponsored jointly by the University and the College of the Bible, “Science and Religion” was the first major conference of the year, by Dr. Julian Hartt, the Noah Porter Professor of Philosophical Theology at Yale Divinity School. Chief Justice Earl Warren took part in the dedication of the new College Law building and received an honorary degree. Senator Everett Dirksen, a lively figure from the political world, came to the campus to address a convocation honoring the late Vice President Alben W. Barkley. The occasion was the unveiling of a replica of a statue of Barkley that was placed among Barkley memorabilia at the University library. The original will stand in Frankfort. Members of the Barkley family attended the ceremony. One of the most popular of the many conferences and symposia held during the Centennial was “Women: Equal But Different.” At the two –day session, attended by 500 women, twelve Kentucky women were honored for various activities and contributions to their community. Part of the entertainment for the AAUP was a horse show staged at Keeneland and a concert by Kentucky musician John Jacob Niles. The Centennial year was also the year of the graduation of the first class from Kentucky’s new College of Dentistry. The high point of the Centennial was Founders Week, 1965. The principal speaker at the concluding Centennial convocation of Founders Day 1966, was the United States Ambassador to the United Nations, Mr. Arthur Goldberg. 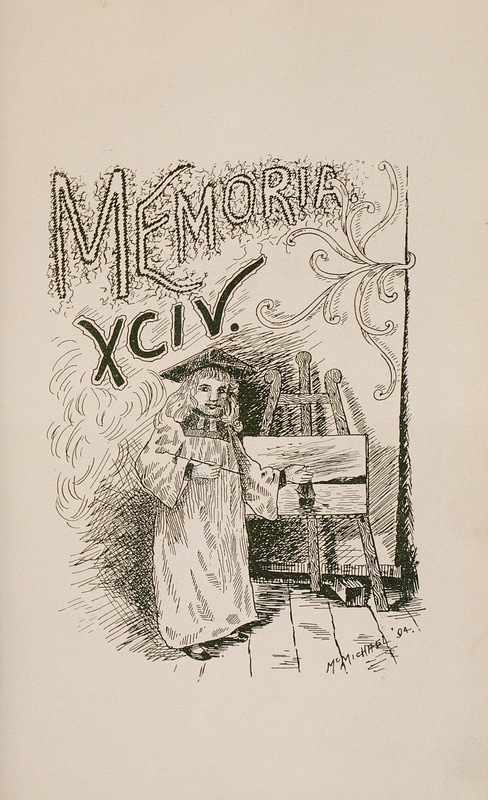 The first known annual at Kentucky State College was titled, The Memoria 1894 and was edited by Felix Kerrick. 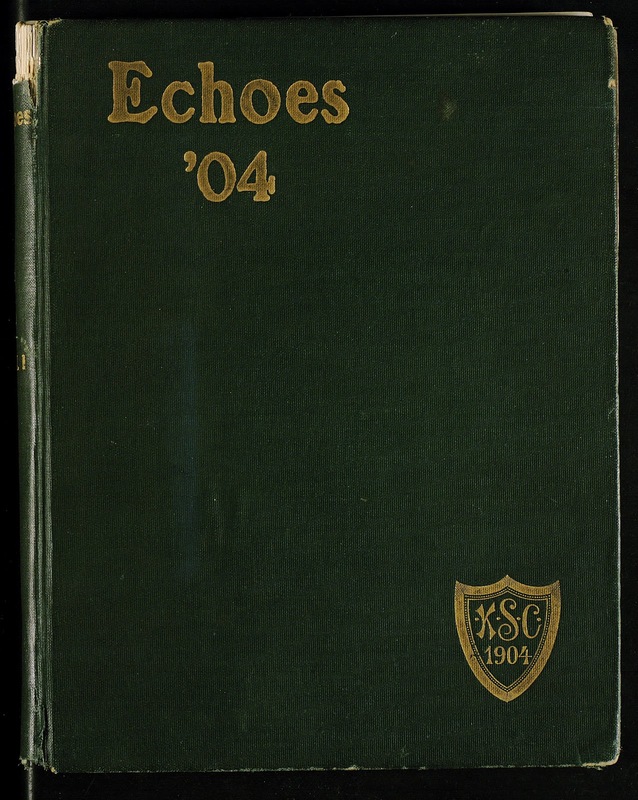 It contained a history of each class, a lengthy history of the University, and numerous feature articles. 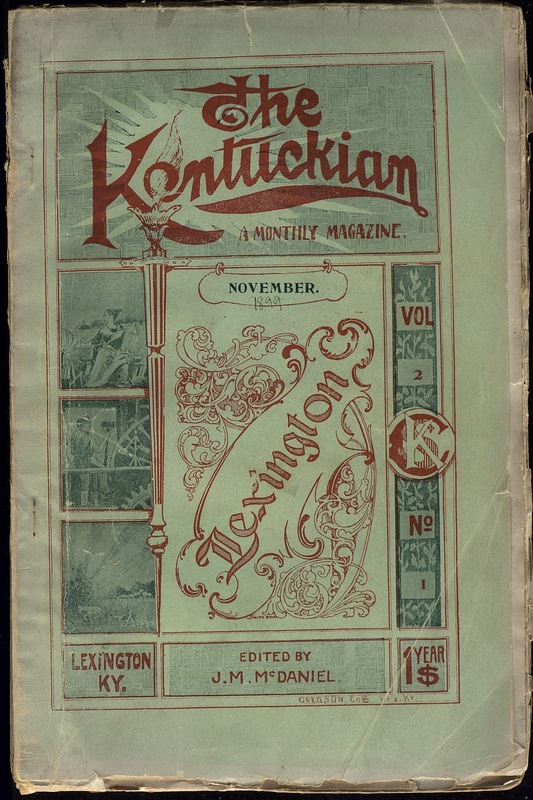 The Kentuckian first appeared in 1899 as a monthly magazine and contained literary essays, poems, editorials, and gossip about campus life. J.M. McDaniel was editor. A series of the magazine-newspaper combination continued for several years. Pictures and sports were gradually added. 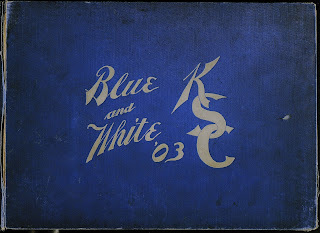 The KSC Blue and White, the first real annual, was published in 1903. It had group class pictures and listed each graduate’s thesis, degree, and major. It also included pictures and a history of each department. 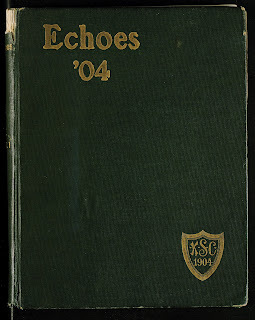 In 1904, William David Gray edited a yearbook called Echoes. This was primarily a senior book with space devoted to individual pictures, nicknames, hometowns, activities, and a quote from each graduating senior. There was no UK annual in 1905. 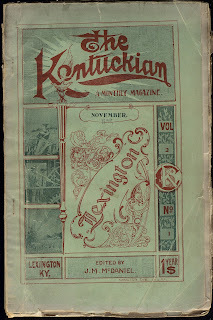 The first of the consecutive annual Kentuckians was published in 1906 and edited by Philip Rieflin. This marked the beginning of great yearbook diversity. 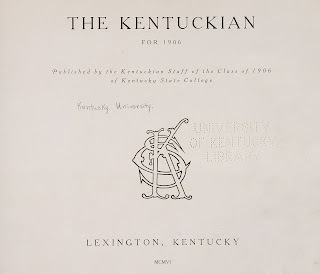 Some have been modern, some reflective, some political, but each a great look into the history, culture, and success of the University of Kentucky. As part of the College of Mechanical and Electrical Engineering’s Silver Jubilee celebration on May 30th 1916 at 10:00 a.m. a monument to American railroad development was erected. 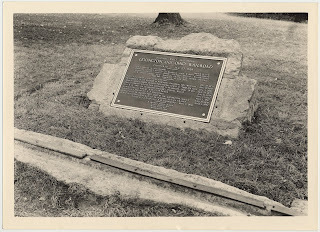 The monument consisted of a restoration of a portion of the original track of the Lexington and Ohio Railroad, the first railroad built west of the Allegheny Mountains. 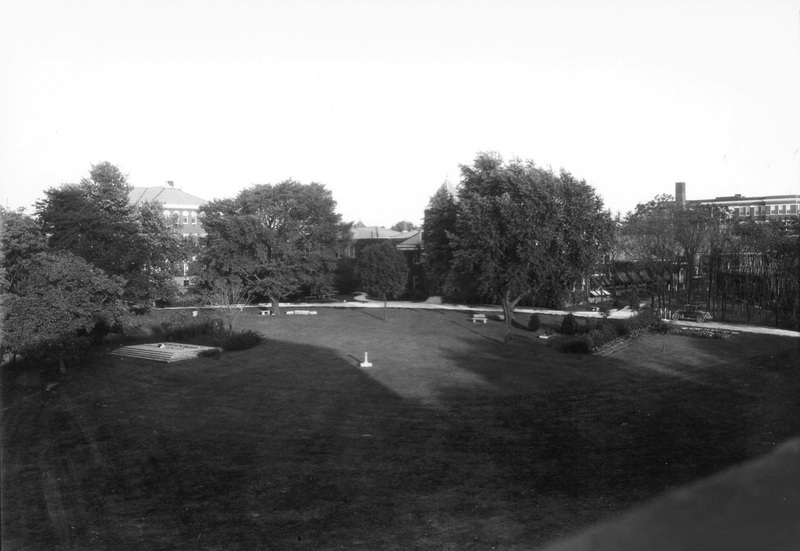 About 25 feet of the original track was to be set on a concrete base on the campus of the University, in front of Mechanical Hall. Left of center is the Railroad Memorial. The building near the center is Mechanical Hall. The Science Building (now Miller Hall) is on the left. The dedication was presided over by Dean Anderson. The dedicatory program had three speeches: “The Development of Railroads and the Locomotive,” by Dr. D.F. Crawford; “The Railroad Builder” by Major James Poyntz Nelson; and the dedication speech by Judge Samuel M. Wilson. A history of the “First Railroad of the West,” by Maude W. Lafferty was printed in pamphlet form and distributed as a souvenir. The Railroad Memorial can still be seen on campus today. It is located behind the Carol Martin Gatton Business and Economics Building and the plaque faces the Anderson Buildings.